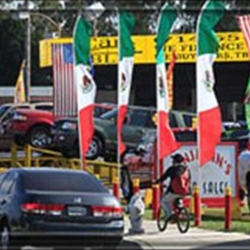 Auto Dealerships are notorious for buying lots of Flags, Pennants and Banners for marketing purposes. There are definitely things you should know when you do purchase outdoor products. NOT all products are the same quality and based upon weather conditions will only last for a period of time. Auto Dealerships are notorious for buying lots of Flags, Pennants and Banners for marketing purposes. There are definitely things you should know when you do purchase outdoor products. There is a life expectancy on all outdoor products. NOT all products are the same quality and based upon weather conditions will only last for a period of time. If your car lot looks like a weekend circus came to town, take down the flags. Flags are designed to grab attention or relay a message. What message are you sending? Make sure that your inventory is what customers look at. GREAT inventory and Professional appearance is WHY your customers BUY from YOU. The cheapest flag you BUY will last you the least amount of time. It's okay to save money. Make sure you know how long the flag will last. Weather conditions play a large part in how long your flags will last outside. Some flags look and last longer based upon conditions. Ask for advice when purchasing the type of flags you’re interested in. Think of the appearance of your dealership like the first step of the sale. “Meet and Greet” Your appearance is important and is the reason why customers visit or pull into your location. Don't CLUTTER your Lot; the inventory is what's important. If your inventory is not the most visible attraction then you need to rethink the display. Use the flags, stickers, pennants, etc to SHOW off your message.